Honey Pots Part Two. Electric Boogaloo! See more honey pots in part one! Sometimes you don’t want to spend lots of money on specialty serveware. These honey pots are budget-friendly and still adorable! Lots of them are from Anthropologie, the place for adorable things. 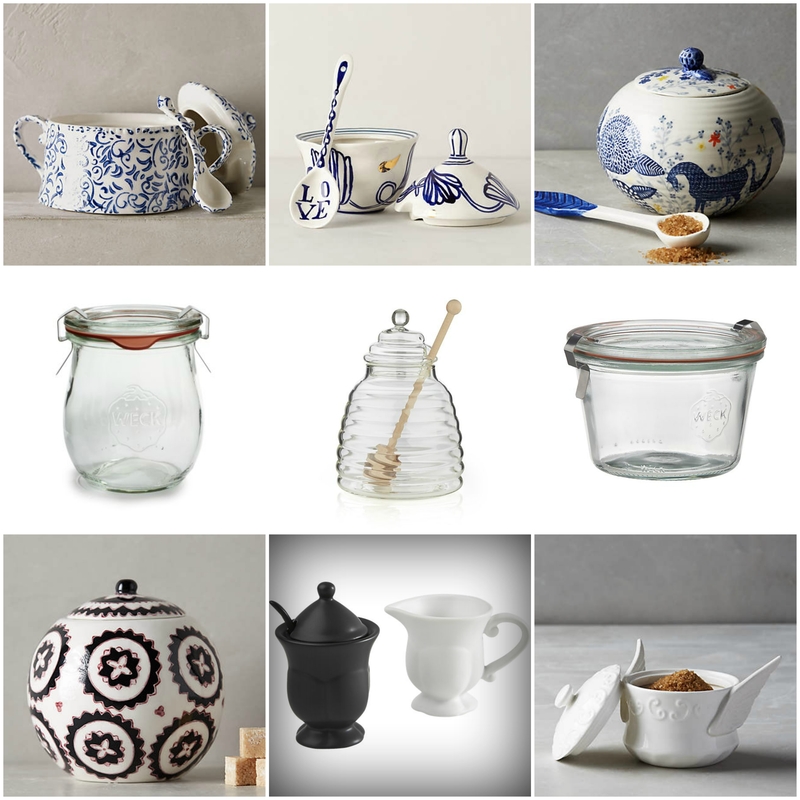 All of these honey pots ring it at under $20! Attingham Sugar Pot – $18 – Also available in pretty pink, I absolutely adore the handles and tiny matching spoon! Jardin Des Plantes Sugar Bowl – $18 – Part of a tea set (with a really lovely creamer), this bowl boasts a lid, whimsical spoon, and a botanically-inspired blue and gold pattern. Just the right amount of glitz. Saga Sugar Bowl – $14 – Another Anthropologie pick, another adorable matching spoon! I like the dreamy Chagall-esque folklore creatures on this bowl. 7 oz. Weck Tulip Jar – $4 – A classic canning jar with a charming bulb shape. The opening is wide enough for dipping slices of apple and the isn’t threaded like a mason jar, so it looks a little more refined. You can order sets of these jars – they are so lovely for homemade preserves. Beehive Glass Honey Jar with Wood Dipper – $8 – A brand new arrival at Crate and Barrel, this little sweetie is topical, but not too twee. 10 oz. Weck Jar – $4 – Another great jar from Weck. The straight sided shape is good for dipping and make these jars suitable for all sorts of interesting culinary uses like molding desserts and pâtés. Gloriosa Sugar Pot – $18 – Pleasingly spherical with a great black and pink design. Chip Cream and Sugar Set – $10 – An absolute screaming deal! This set would be at home at afternoon tea, at breakfast or with dessert. I especially like the strong, simple black and white color combination with the slightly retro-ironic shape. Birdsong Sugar Pot – $16 – This winged beauty would be a welcome addition to my serveware arsenal. It’s a little twee, but might pair well with an earthy, woodsy platter. Universal Expert Sharing Dishes – $15 – Three white porcelain bowls in a simple beech wood trivet. Use the middle bowl for honey and the other two for slices of apple! 2-Piece Marble Dip Server – $25 – The priciest item in this post, but my favorite. Marble is such a luxurious material and this two piece set could be used year-round for all sorts of dishes. Stainless Steel Snack Bowls – $10-20 – These bowls have a lovely serving angle, tilted up, ready for dipping! Bird Bowl – $11 – Also available in blue and white, these little bowls toe the cute-too cute line perfectly. I would arrange one of each color along a long olive wood serving board. Bread and Olive Oil Plate – $7 – Fill the smaller section with honey and line up your beautiful apple slices in the larger. 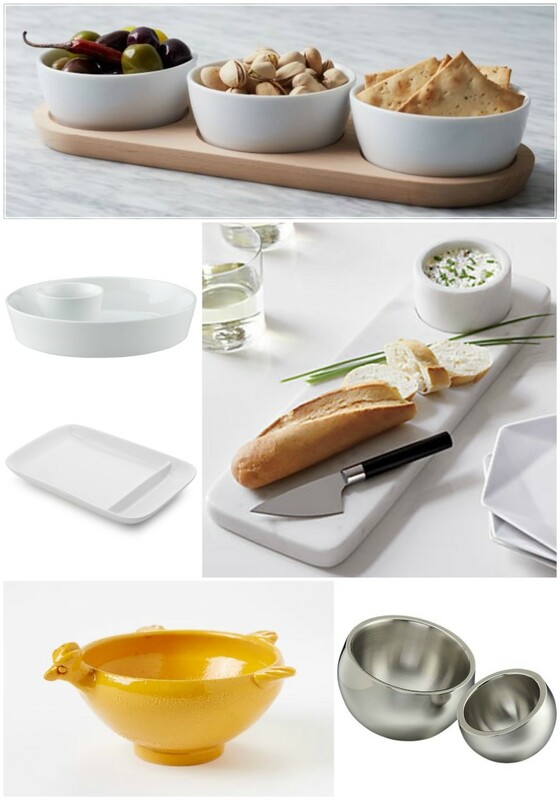 2-Piece Chip and Dip Set – $16 – A good deal for two coordinating oven-safe porcelain bowls. I would use the larger bowl later in the year for salad, gratins, and veggie side dishes and the smaller bowl for olives, pistachios, and hot cheesy dips! I hope you enjoyed this round up! Stay tuned for homemade yogurt and my sample HHD menus!